Time to Celebrate More Sunny Days! And a train ride through the hills would be very lovely indeed! I love that we are in the month of June. Spring/Summer are the best times of the year! 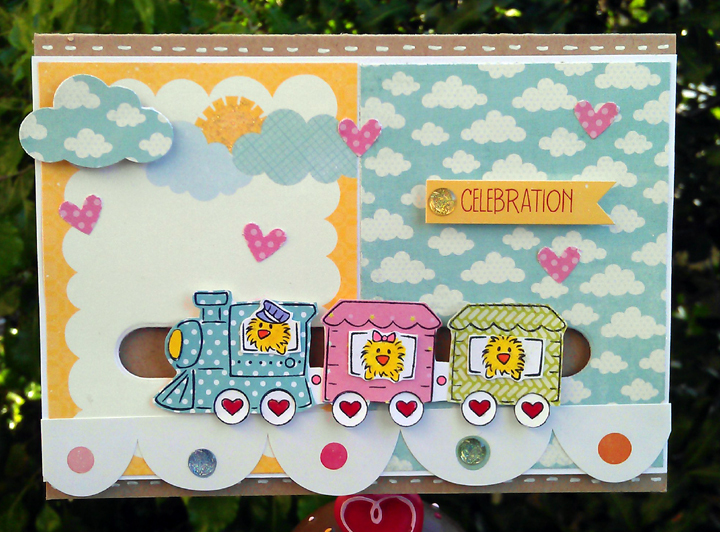 Recipe: CS from PTI, Chickie Train Stamp from DeNami Design, PTI Movers and Shakers, Cloud punch, Bling. This entry was posted in Cards for Other Occasions and tagged Celebration Cards, Chickie Cards, Chickie Train Cards, DeNami Design, DeNami Design Cards, Train Cards. Bookmark the permalink.